12 Unique Back Tattoos for Men - Picnic! Angel tattoos can be really spectacular on the back. Because the back is such a large area the angel can be designed with huge impressive wings. Fallen angels are also a great inspiration for tattoos. Weeping angels with sculpted wings can be done for memorial tattoos or to commemorate a life change or event. Some people choose to use angel tattoos to represent their children or another family member. There are a lot of ways that a skilled tattoo artist can create a stunning unique angel design that will fit your back. Dragons are another great motif for back tattoos. Mythical dragons are huge in scale which makes the back the perfect location for a dragon tattoo. The scale details will stand out on the back and give the image a lot of depth. Whether you choose to have the tattoo done in black and gray or in color the image will be one that stands out. Dragons are symbols of protection, strength and power so having a dragon tattoo on your back sends a very powerful message. If you want a tattoo to honor someone that you have lost or a pet that you have lost the back is the ideal location for a memorial tattoo. You can choose to get a portrait done or work a memorial phrase or image into a larger design. Because the flat and large back surface gives the tattoo artist so much room to work with you have a lot of options for creating a truly unique memorial to honor a beloved friend or family member. Colorful Japenese Koi are the basis of many different tattoos. But the unique surface area of the back means that a tattoo artist can create an entire Koi pond in gorgeous ink on your back. The brighter the colors of the koi the better the luck you will have, according to myth. If you love colorful tattoos that are true pieces of art but you have to hide your body ink because of workplace rules koi inspired back tattoos give you the beautiful ink you want that can also be hidden when necessary. Yakuza style tattoos are incredibly elaborate and person. Events from your life will be interwoven with traditional Japanese design elements to create stunning full back tattoos. These tattoos often take months to complete because they will cover the entire back. Some people start with the back tattoo and over the course of several years get an entire bodysuit of tattoos covering all of the skin from their neck to their knees or ankles. If you want an ironic tattoo you can get elements of the body like tissue, muscle and bones tattooed on your back. 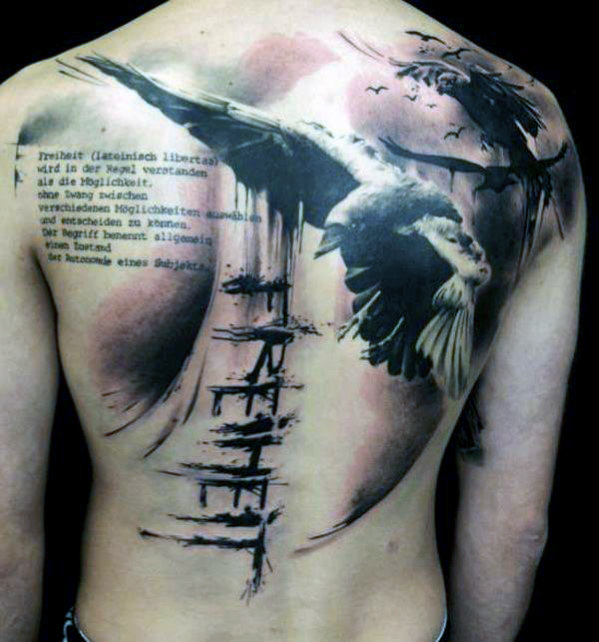 The entire musculature of the back can be tattooed on your back for a freaky effect. If you love science and anatomy you can design some truly amazing body tattoos for the back. Just be sure that your tattoo artist is experienced with tattooing body parts and muscle so that the tattoo looks realistic. 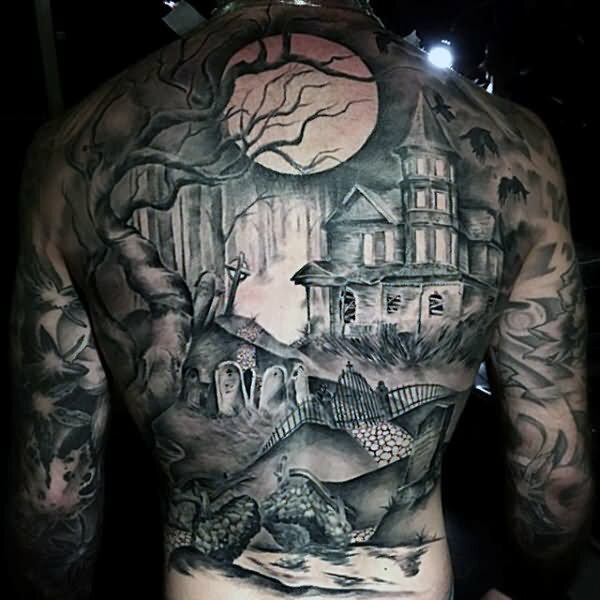 If you love science fiction and fantasy you can work with a tattoo artist to create some stunning back tattoos that feature scenes from your favorite science fiction books and movies. Star Wars tattoos are very popular, so are scenes from graphic novels. Also classic books like The Hobbit are fun inspirations for tattoos. Harry Potter, Twilight and the Game of Thrones novels also are great inspirations for tattoos. Religious iconography and symbols are popular back tattoos. Crosses and other symbols of faith along with devils, angels, and religious scenes are the basis for some amazing tattoo art. Getting a patron saint tattoo or a religious phrase or poem tattooed on the back is a meaningful way to proclaim your faith as well as to metaphorically make sure that the Divine is watching your back. Religious tattoos are also sometimes created in conjunction with memorial tattoos to create memorial art for a lost child, parent, sibling or friend. Often people in dangerous professions will get large back tattoos that represent the occupation. Firefighters, police, emergency medical professionals and military members will get their unit mascot or creed tattooed on their back as a symbol of loyalty to their coworkers and their job. Or they may choose to get a protective figure like an angel or a saint tattooed on their backs as a form of protection. Many will also commemorate special events like deployments overseas or brushes with death in tattoo form. The mythical symbol of transformation, the Phoenix, is a gorgeous tattoo inspiration. Many men choose to get a Phoenix tattoo to represent a massive life change that has forever changed them. Achieving a huge goal, entering a new career, surviving cancer or another disease, surviving a military deployment or other major life changing events are all things that can be symbolized by a Phoenix tattoo. The image of a Phoenix rising from the ashes after being transformed is a very powerful one. Spiders are also powerful images, and spiderwebs are fantastic tattoos that look great. Any men with a dark or macabre senses of the world will appreciate the gorgeous imagery of a spider and intricate spiderweb. In Mythology the spiderweb represents the web of life and the interconnections of all things, so getting a spiderweb back tattoo is a powerful statement about the nature of life. It also can be beautiful in a creepy and dark way. Getting words or phrases tattooed on the back is an alternative to getting a huge back tattoo. Instead of getting a large or intricate tattoo on the back some men are opting to get a meaningful word, phrase, or date tattooed down their spine instead. Even though tattoos like this don’t have the impact that a bright and colorful or large back tattoo has they still make quite an impact. Kanji symbols or a foreign phrase that is meaningful also makes an interesting back tattoo. If you love the idea of a meaningful back tattoo but don’t want to get a large tattoo getting a word or phrase tattooed on the back is a good alternative.